Leaders of sangyokumiai (cooperatives) interested in insuranceIn Germany, Raiffeisen (1818-1888), whose cooperatives model was adopted by Japanese sangyokumiai (cooperatives), envisioned the cooperatives insurance in 1872. He tried to carry out it in the rural credit cooperatives, but the German government refused it. Then he withdrew it and later carried out it based on modified plan. In Japan, executives of sangyokumiai (cooperatives) also seemed to have been interested in insurance from early times. Yoshio Udo (1876-1937), who became vice president of sangyokumiaichuokai (general association of cooperatives) later, published a paper titled “Insurance business and Cooperatives” in the magazine “sangyokumiai, No. 14” issued in December 1906. He also cited the name of “insurance cooperatives” in articles that he introduced agricultural cooperatives situation of the United Kingdom. In addition, he published a paper titled “Insurance effect by sangyokumiai (cooperatives)” in the magazine “sangyokumiai, No.130” issued about 10 years later. In October 1907, Tosuke Hirata, president of sangyokumiaichuokai (general association of cooperatives), talked about “Insurance system and sangyokumiai (cooperatives),” in greeting of Hyogo branch office of the association. German adviser for minister of Agriculture and Commerce, Paul Mayet (1846-1920), advocated the creation of state-owned fire insurance system and wrote the “Japanese house insurance theory” and “agricultural insurance theory”. He touched with the mutual insurance cooperatives in his book. However, he only mentioned it from the view of disaster compensation. Therefore, it is doubtful that Mayet is referred to as a “pioneer of the agricultural cooperatives mutual insurance”. From the second half of Meiji era to the first half of Taisho era, there had been no resolution to demand cooperatives insurance at any national congress of sangyokumiai (cooperatives) held in various places. During this stage, sangyokumiai (cooperatives) seemed not to try to implement the insurance business, nevertheless having an interest. When it came to the Taisho era, people insisting actively the implementation of cooperatives insurance in the sangyokumiai (cooperatives) appeared. 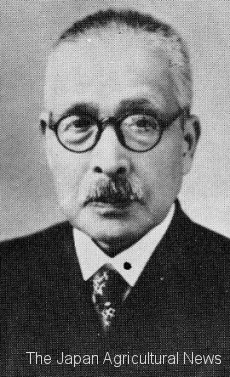 They were Hitoshi Doke (1957-1925), director of sangyokumiaichuokai (general association of cooperatives), and Kanji Sato (1879 – 1967, later vice president of sangyokumiaichuokai, later professor of Tokyo Imperial University, and later president of Tokyo agriculture University). 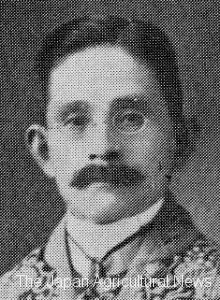 Sato published a paper entitled “New mission of sangyokumiai (cooperatives) ” in magazine “sangyokumiai” in April 1914. At this stage, he did not yet say that sangyokumiai should run insurance business. In addition, Sato said 1) To expand life insurance to rural areas, sangyokumiai (cooperatives) need to act aggressively, 2) sangyokumiai (cooperatives) should be financed at low interest in response to insurance payments, 3) insurance premiums should be reduced so that farmers can join. 4 years after the proposal, Sato went western countries and visited the cooperatives of foreign countries. This became the foundation to bring “cooperatives insurance” to our country. In November 1920, Doke departed to attend the General Assembly of the International Institute of Agriculture held in Rome. Sato and Doke went to most of the European countries. Two persons, whose purpose and period of foreign trips were different, but held the returning report meeting together on 17 June 1921. In the report of Doke, “The thought of insurance business by cooperatives” had been clearly put forward. Doke and Sato introduced foreign examples and proposed insurance business by sangyokumiai (cooperatives). Their claim began to penetrate into the sangyokumiai (cooperatives). Finally, their thought became publicly. On 14 April 1924, the 20th national congress of sangyokumiai (cooperatives) was held in Fukuoka. In the congress, insurance business problem was proposed for the first time, and it was resolved that sangyokumiaichuokai (general association of cooperatives) should investigate and research. After that, every year the congress submitted resolution to demand insurance business but did not reach the goal. This entry was posted in Booklet, Cooperatives. Bookmark the permalink.